Disney Editions has an exciting release schedule over the next six months. Honoring some of the coolest characters, themes, and elements of all things Disney, these six titles should be on your “Disney wish list” for a variety of reasons. Here is my preview of upcoming Disney Editions books! In honor of Disneyland‘s 60th Anniversary, Disney In Depth will dedicate each edition in July to Walt’s original park. Accordingly, it only seems fitting to notate some of the elements that make Walt Disney’s original playground so special. This marks the first half of a two-part edition that recognizes 60 of my favorite things to do while spending time at the happiest place on Earth: Disneyland. It was four years ago this month at SDCC 2010 that Guillermo del Toro announced his plans for a reboot of The Haunted Mansion for Disney based on their popular theme park attraction of the same name. Since then, the filmmaker has been involved with so many projects – Pacific Rim and its planned sequel, Crimson Peak, an adaptation of H.P. Lovecraft’s At The Mountains Of Madness, the upcoming FX TV series The Strain based on his novel, and much more — that it seemed like Del Toro’s plans to bring a frightened version of the tale to the big screen had fall to the wayside. Recently, Del Toro did an AMA (Ask Me Anything) on Reddit where he gave a brief update on The Haunted Mansion where he mentioned that they’re having trouble finalizing the screenplay, but they are developing art pieces and maquettes of the Hat Box Ghost and more. 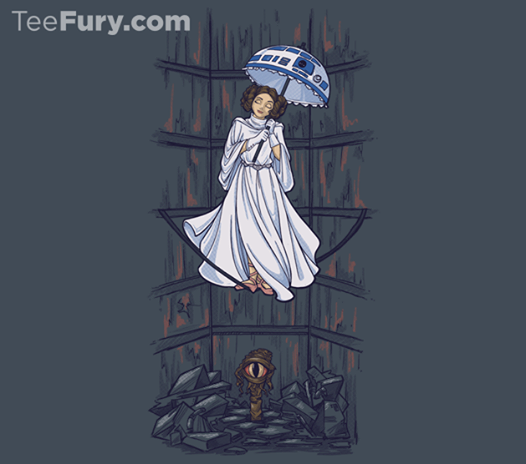 The $11 t-shirt deal of the day over at TeeFury today is a mash-up of Star Wars and Disney’s Haunted Manson called “Leia’s Mortal State” by khallion. The sale began at Teefury today, Monday, June 9, 2014, at midnight EST, and will continue for 24 hours from then, and once it’s over, it will not be sold on the site for $11 anymore, though it will continue into the next day for $14 (look for the After Hours bar at the top). Watch Now: Are There Real Ghosts Inside Disney’s Haunted Mansion Ride? 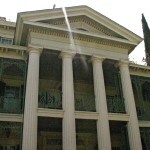 Are there real ghosts inside The Haunted Mansion, the famous ride at Disneyland? A new video claims that the answer to this question is “yes,” and you can check it out below. The story, as told to the Disney blog Inside the Magic, is that an “anonymous cast member” sent along a single blurry image as a tease of a supposed little boy ghost haunting The Haunted Mansion ride (see it here), and a promise of a full video to come. That video did eventually come. But the question remains, is it real? Be sure to click on over to the other side to watch the video and decide for yourselves. We Disney aficionados simply cannot obtain enough neat tidbits of trivia, seeking answers to everyday quandaries that strike us. Fortunately, Disney Editions just released a fine trivia book that puts many questions to rest. Dave Smith, Chief Archivist Emeritus of the Walt Disney Archives, has long been known to help fans with this endeavor in his legendary “Ask Dave” column. 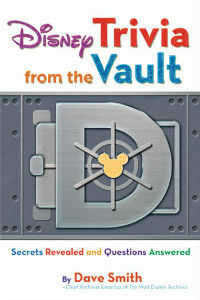 Now, Smith, author of this fact-filled title Disney Trivia from the Vault: Secrets Revealed and Questions Answered, has compiled together over 1,000 questions, providing responses and well-explained descriptions as well. 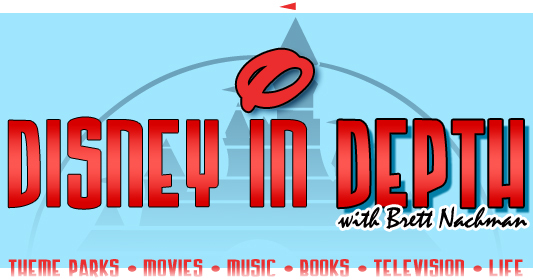 In this edition of Disney In Depth, I’ll impart my thoughts on this book, and also share some of the more unique questions and answers that you can find inside Disney Trivia from the Vault. I’ll give you 23 fun facts. Why 23? If you’re a Disney fan you should know the reason. (1923 is the year the company was founded). At just over 250 pages, this eight-chapter book, each dedicated to a different aspect of The Walt Disney Company, contains a vast variety of little-known pieces of trivia that you can bring up at social events. Well, I’m not sure how relevant bringing up the “Kids Amateur Dog Show” at Disneyland from the 1960s would be, but would you know about that had you not picked up a copy of this? I don’t think so. The allure of trivia books is that they contain such oddball details, each with fascinating and extensive stories, making this a treasure trove. In 1963, Disneyland Records released an album called Chilling, Thrilling Sounds of the Haunted House which contained narrated creepy “haunted house” sound effects taken from the Disney Studios library, with explosions, spooky ghost sounds, attacking birds, and more. Disney Parks Blog has posted a short video sample of the album, which you can check out here below. A new interactive queue is coming to The Haunted Mansion attraction at Magic Kingdom Park at Disney World Resort in Florida. Disney Parks Blog has released a video sneak peek at the ride’s queue, which you can watch here below. If you’ve ever visited this popular haunted attraction, you’ll recall seeing grave stones and other spooky elements throughout the queue that leads to the ride. Now, the Imagineers at Disney have taken some of those familiar elements and placed them throughout the area, and they’ve also added new features that not only introduced never-been-used concepts, but also make them interactive. Happy Anniversary To Disneyland’s Haunted Mansion! This week marks the anniversary of the opening of one of my favorite theme park attractions — the Haunted Mansion at Disneyland in California. The Haunted Mansion, which was under development for 15 years, officially opened to the public at the Anaheim, CA, theme park on August 12, 1969, and marked the first attraction developed and opened without Walt Disney, who had died in 1966. Visitors to the attraction board a Doom Buggy inside this spooky mansion, located in the park’s New Orleans Square section, where 999 happy haunts live out their posthumous lives, and are pone to hitchhiking! Last month at Comic-Con in San Diego, filmmaker Guillermo Del Toro announced that he’d be doing a big-screen adaptation of the Haunted Mansion attraction, but unlike the 2003 Eddie Murphy movie of the same name, Del Toro’s version will actually be frightening. 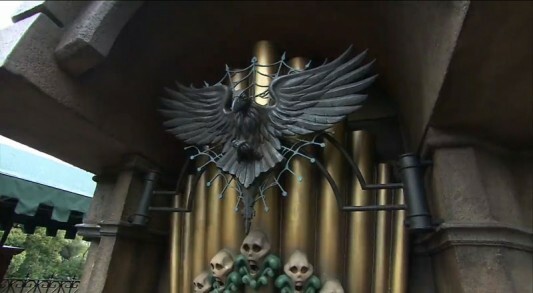 At the Walt Disney Pictures panel in Hall H at the 2010 San Diego Comic-Con, moderator Patton Oswalt introduced a very brief teaser for what is to be a Haunted Mansion reboot, which simply showed The Hatbox Ghost character from the famous Disney theme park ride with the voiceover from the ride. After the teaser, Oswalt asked the crowd what director would be chosen for such a reimagining. 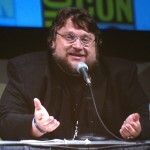 To everyone’s surprise, that person is the one and only Guillermo del Toro, who make a surprise appearance at the panel. Del Toro said that his reimagining of The Haunted Mansion will be live-action and in 3D, and will not be a comedy. He joked that he was not be answering any of Eddie Murphy’s calls, making it clear that his film won’t be like the one Murphy starred in in 2003 that failed to hit with audiences. The director, who expressed that his love of the popular theme park ride began at age 3 when he first went to Disneyland the same year the ride opened there, said that his film will be scary but fun, though mostly scary, stressing that children who see the movie will be frightened.